Behavioral Interventions--For Kids! : Love is in the air! Here are a couple of awesome Valentine activities requiring only scissors, glue, markers and construction paper! These are an easy and fun alternative to a Valentine for family. Use anything you have, and let them get creative. 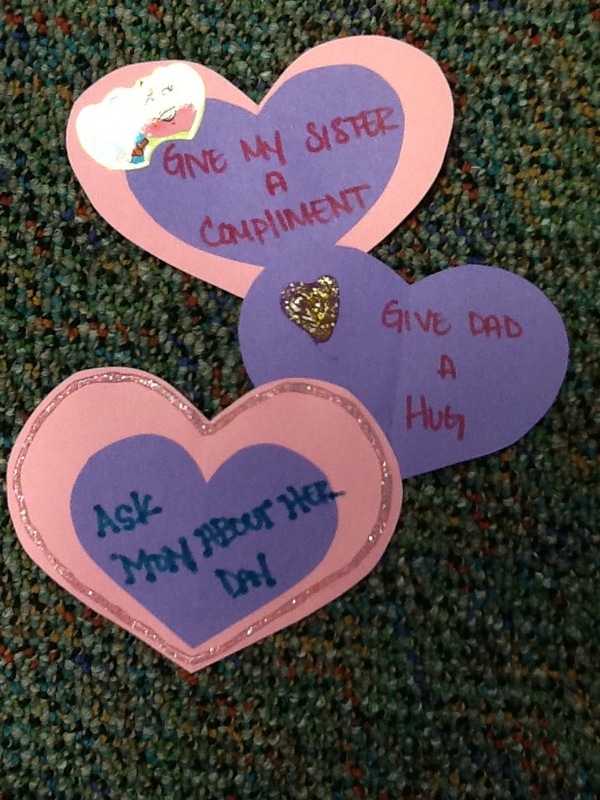 Have your client write an act of kindness or something they will go out of their way to do for their family for Valentine's day. An obvious way to teach appreciation and positive interactions with family, but is also a way to sneak in some communication skills! Really excited about this one, they turned out super cute! 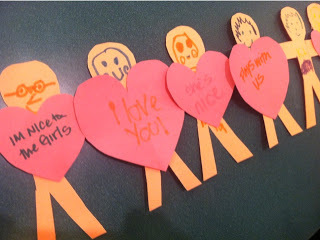 Make a paper people chain just like you did for Chain Chain Chain. 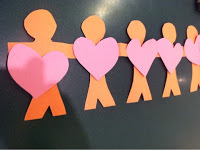 Have your client assign a paper person for each member of their family. 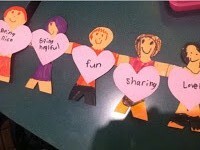 Let them decorate each member, emphasizing positive aspects of their family. 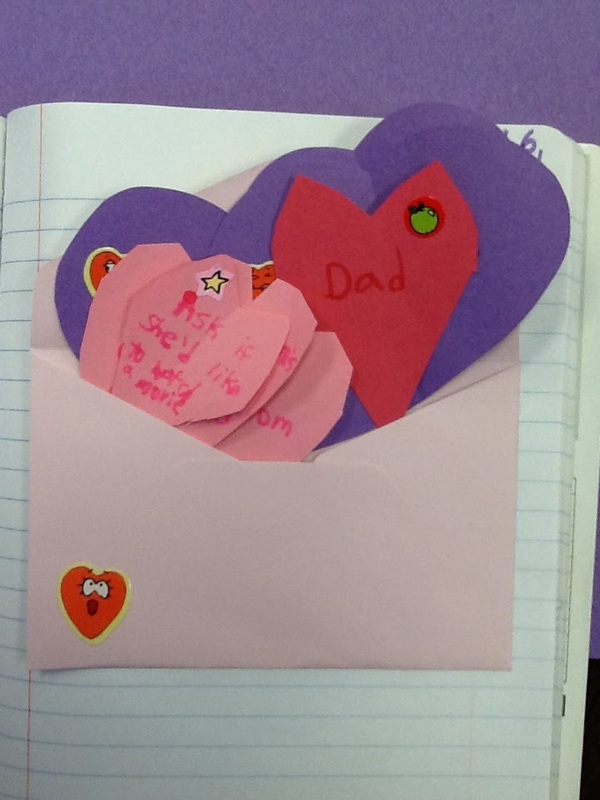 Cut out hearts and have them write a quality they love about each member of their family. This was a great project. I did the family chain one with my 8 year old boy....not only did he enjoy it but since the session started rough I was so glad he was actually able to refocus and work well the rest of the session. I'm fairly new at this job, I have only been working in the field since June 2012. I have found your ideas really really helpful. I hope one day I come up with them as easily. I do have a request for advice. I am doing pretty good with all my younger clients, especially with all these great activities. But I have a 13 year old and I find myself stumped on what to do with her. I don't want anything to seem childish, but just talking and journaling will obviously get boring quickly. Advice? Becca, Thank you so much for your comment, it is tough to start out, but those ideas will come to you soon enough! As far as teenagers, that is my favorite age group, and I have tons of ideas. Email psrideaweb@gmail.com with an email address and I'll give you some advice. Happy Sunday! 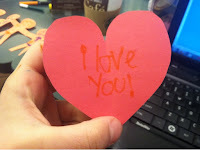 I hope to maybe see some new Valentine's day projects this year if you have any new ideas. I did both of these last year so it would be cool to have something new for this year since I work with a few of the same kids. Love your ideas.